Health Frontiers welcomes both generalist and specialist physicians in the fields of Emergency Medicine, Internal Medicine and Pediatrics to volunteer by sharing their expertise through bedside and didactic teaching. 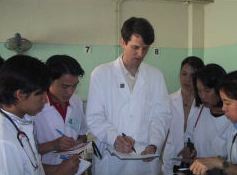 Volunteers also participate in educational activities including case conferences and journal club. Visiting physicians work collaboratively with Lao physicians to help manage patients seen in the hospital. Emergency Medicine, Pediatric or Internal Medicine residents with an interest in international health are strongly encouraged to consider a one-month rotation in Vientiane. This is an excellent opportunity to be immersed in the culture and health care system of another country, within the structure of a residency program. The residents are eager to learn from and collaborate with visiting doctors, and work very hard despite limited resources. Health Frontiers will arrange for the visiting resident to be matched with a senior resident with good English language skills. The rotating resident is expected to work closely with the residents during their work hours, collaborate on patient care and participate in all of their educational activities. Prior international health experience is not required; however, the abilities to demonstrate adaptability, independence and cultural sensitivity are all very important.